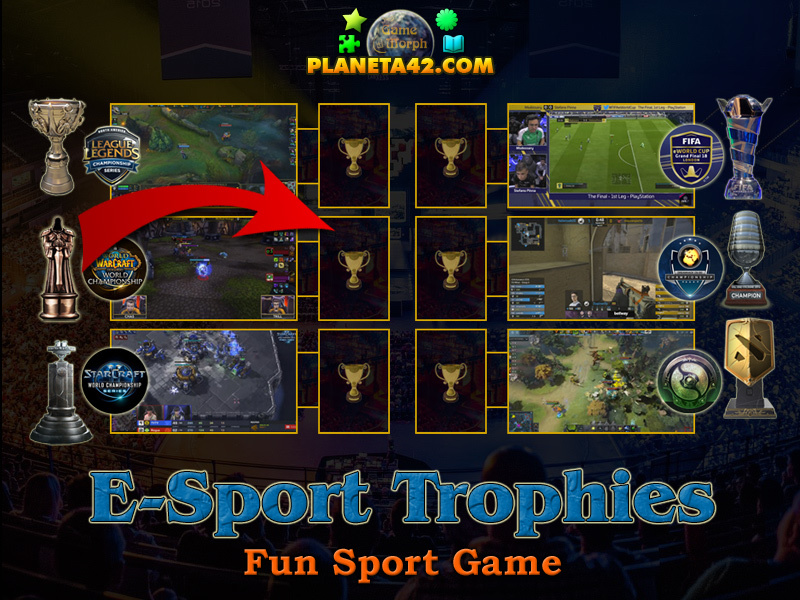 6 e-sport trophies in a fun online sports learning game. "Electronic Sports Trophies" is a free online game to sort the trophy on the correct e-sport. Sports learning game about famous esport games. Know popular games played in worldwide electronic sport tournaments and the trophies the players recieve from them. Sports learning game. Drag and drop sports. How to play Electronic Sports Trophies. There are 6 trophies (cups) of famous e-sport games on the top of the screen. Drag and drop them at the trophy sockets in the middle of the screen. Every trophy correspond to one computer game e-sport tournament. Roll over the picture of the tournament gameplay to understand wihich game tournament it is. Click on the picture to load the tournament grand final match in You tube. Sort all trophies to win the game. Know about 6 e-sport games and win +1 Knowledge Level. Esports, also known as electronic sports, e-sports, or eSports, is a form of competition using video games. Most commonly, esports takes the form of organized, multiplayer video game competitions, particularly between professional players and teams. Although organized online and offline competitions have long been a part of video game culture, these were largely between amateurs until the late 2000s, when participation by professional gamers and spectatorship in these events through live streaming saw a large surge in popularity.By the 2010s, esports was a significant factor in the video game industry, with many game developers actively designing toward a professional esports subculture. The most common video game genres associated with esports are real-time strategy (RTS), first-person shooter (FPS), fighting, multiplayer online battle arena (MOBA) and battle royale games. Popular games for esports include MOBA titles League of Legends and Dota 2, FPS title is Counter-Strike. Which games are played for electronic sports? Which are the most famous e-sport games? What prizes players receive from eSports? Labels: Sport Games , sSport Games , Puzzles , Learning Games , Education Games , Free Online Games.